The 90s! What a time. Cell phones were still new. CDs were a big deal. The world wide web was in its infancy. On the internet, things looked basic. And that was cool! For instance, auto.com—check out that stylish layout up top! If you visited auto.com today, you’d find a straightforward website that allows you to purchase a new or used car. But that wasn’t always the case. 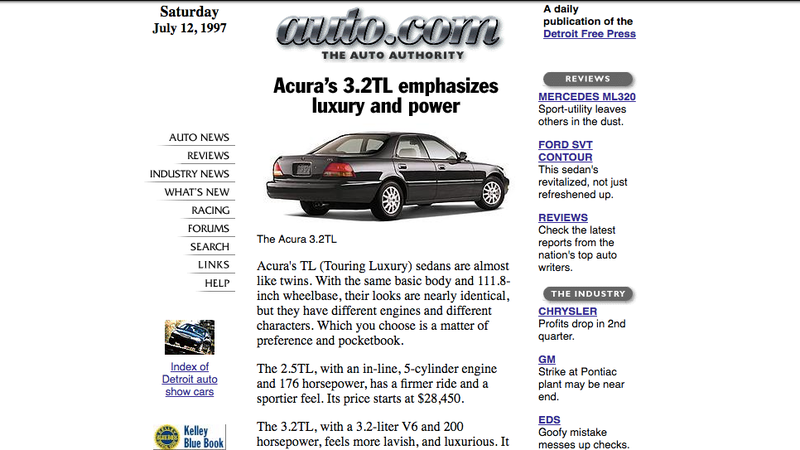 Launched in 1996, the Detroit Free Press purchased the auto.com domain as it joined the rest of the journalism industry and started running stories online (all the while failing to realize what this would due to advertising revenue, but I digress). The newspaper billed the site as The Auto Authority, and thanks to the Internet’s archive, Wayback Machine, we’re able to see what it was like back in the day. Who needs photos! This was cool. The news—but online! Auto.com also had a jump on the world of forums, which I’m sure were pleasant and nice in 1997. Users can’t post libelous or pornographic material? What kind of car enthusiasts visited this site back in 1997! Unfortunately, the forums weren’t scraped by Wayback, but I’ll just give all of you who frequented the site a grain of salt and presume you were kind and nice to one another. — Automotive stock reports, updated throughout the day. Streaming video! I was only seven at the time, but I sure as hell don’t remember having anything better than a 56K modem until the early aughts. How good could the stream have been? I can’t say, but check out the Jeepster! The auto.com team got fancy with its photo gallery photo gallery for the auto show. Check out that image to the left—if you squint closely, you can almost make out what’s popping up. Auto.com, the premier Web site for automotive news has launched a new feature for users who have Palm Pilots, Windows CE devices and other types of handheld computers. Busy people can now download daily news reports from Auto.com (www.auto.com), then read them offline, when they’re in meetings or traveling. The feature takes advantage of software from AvantGo (www.avantgo.com), which delivers Web content to handheld computers. Palm Pilots! I held one ... once. By the looks of it, the Free Press sold auto.com in the mid-2000s, around the time the newspaper merged business operations with The Detroit News. I miss the internet of old.